This paper assesses sources of economic growth in Cuba during the period 1990–2008, with the purpose of identifying factors behind long-term growth dynamics, as well as those explaining short-term growth developments. The period chosen covers what is known as the “Special” period after the collapse of the Soviet Union (1990–1995), as well as the recovery period that ensued (the “Transition” period). 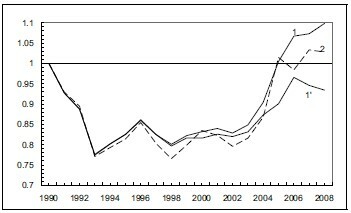 The fact that the analysis is based on the post-1990 period, instead of a longer one, is justified by the structural differences characterizing the Cuban economy before and after 1990. In particular, the post-1990 period is characterized by strong structural change, in which the economy had to adapt to losing the preferred status that it enjoyed among COMECON countries. In broad terms, such status was reflected in sustained deficits in the balance of goods and non-factor services with COMECON countries (in particular the former Soviet Union), which helped fuel relatively high investment rates. In contrast, the post-1990 period is characterized by relatively low investment rates, coupled with very variable, but mostly positive net exports of goods and non-factor services. In turn, the “Special” and “Transition” periods each has its own defining characteristics. In this connection, the period 1990–95 is characterized by significant negative growth rates of GDP, increasing unemployment rates, decreasing labor force participation rates, declining investment rates, increasing obsolescence of the physical capital stock, and strongly decreasing capital stock utilization. In contrast, the period since 1996 has been characterized by positive economic growth, decreasing unemployment rates, increasing labor participation rates, and increasing capital stock utilization. Investment rates, however, remained relatively low, though marginally higher than during the first half of the 1990s. Of special note is the significant role that net exports have played, in particular since 2003. It is for this reason that the paper also assesses the strength of international factors behind the post-1995 recovery of the Cuban economy, with an eye toward identifying sources of vulnerabilities. Such an analysis depends, to a large extent, on the quality of information used. 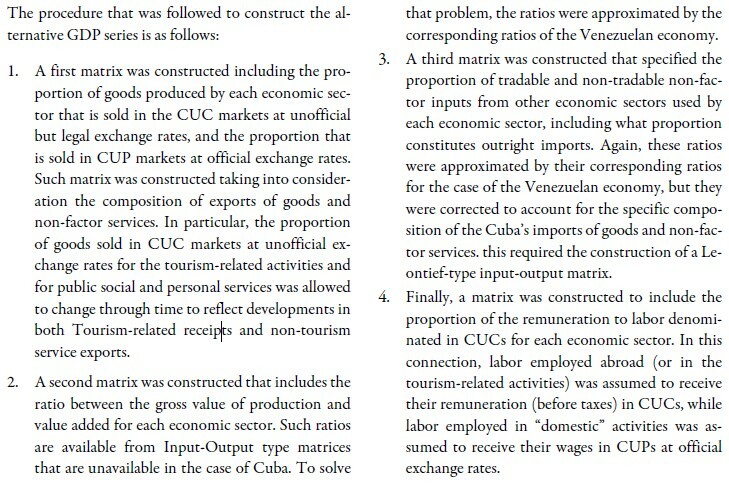 In the case of Cuba, the existence since the second half of the 1990s of the dual monetary and exchange rate system (in which a convertible currency, the Peso Cubano Convertible, CUC, coexists with a non-convertible currency, the Peso Cubano, CUP) introduces challenges to the measurement of national income (Di Bella and Wolfe, 2008). In particular, the use of official exchange rates in the compilation of national accounts (the practice followed by the National Statistics Office) may bias downwards the share of tradable sectors in total GDP, which results in an underestimation of the extent to which the country is vulnerable to external shocks. In addition, the utilization of official exchange rates may bias upward the share of wages in national income and downward the share corresponding to the remuneration of capital. In order to account for the impact of the dual monetary and exchange rate system in Cuba’s national income, the analysis in this paper uses using two data sets. For the sub-period after the introduction of the CUC, the first dataset comprises the official national accounts and labor data published by the National Statistics Office. The alternative dataset, in turn, includes an adjustment to the national income series to capture the (estimated) extent to which different productive sectors’ income and expenditure accounts are denominated in CUCs and/or CUPs. The resulting flows are expressed in a common currency (which could be either the CUP or the CUC), using unofficial but legal exchange rates instead of official exchange rates. Although the resulting series constitutes only a rough approximation of the “true” underlying accounts, it provides a benchmark against which the analysis using official data can be compared. Needless to say, an accurate assessment of factors contributing to growth is important for a number of issues, including potential GDP growth forecasting, the sustainability of long-run fiscal policy, and the solvency of entitlement programs (Gordon, 2003). 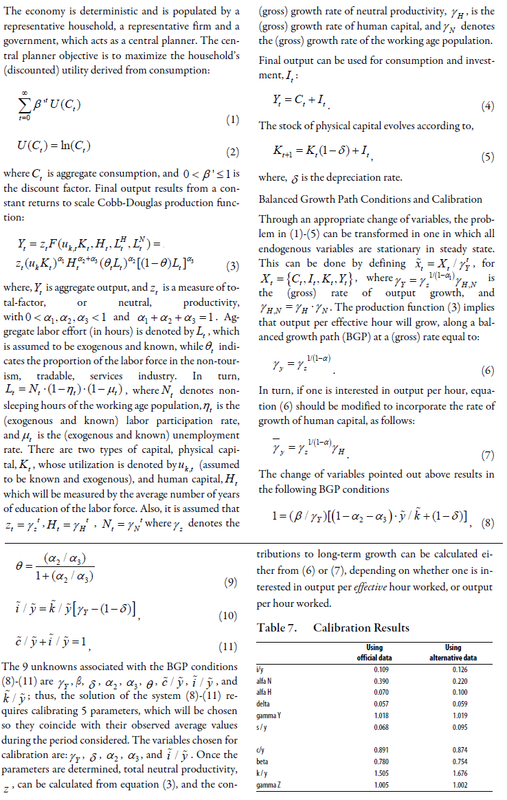 Although there are plenty of examples of growth accounting exercises in the literature, this paper constitutes a first effort in the case of Cuba. Similarly, it constitutes a first attempt at measuring the strength of linkages between Cuba’s economy and its trading partners (both in goods and non-factor services) at a country level. The analysis finds that a significant portion of the growth dynamics since 1996 has been explained by an increase in the utilization of factors of production toward more normal levels after the collapse in their use during the first half of the 1990s. After such “shortterm” factors are accounted for, long-term growth prospects appear poor. The long-term growth outlook is even poorer (with per capita growth rates of about zero), once the adjustment to the national income accounts is made; these results may be in part explained by the same underlyingfactor: the poor track record on investment over the last two decades. In addition, the recovery in economic activity, in particular since 2003, depends strongly on exports of non-tourism services. Since the market for such exports is highly concentrated, the recovery in GDP is highly vulnerable to a decrease in external demand for this type of services. In this connection, when exports of non-tourism services are excluded, the observed gains in total factor productivity during the last years dissappear. The paper is organized as follows. The first section describes the data sets used. The second describes the methodology used for long and short-term growth accounting and the analysis of international linkages and resulting vulnerabilities. The third section presents the results of the analysis. The final section discusses and concludes. The availability and quality of economic data in Cuba has made growth accounting exercises and vulnerability analysis very difficult to undertake. In terms of quality, one of the main stumbling blocks is that national accounts statistics compiled during most of the 1958– 1989 period used the “Material Product System” (MPS), a technique developed in the former Soviet Union and used by most centrally planned economies. The use of the MPS complicates growth accounting exercises and cross-country comparisons. After the collapse of the Soviet Union, the MPS technique was abandoned in favor of SNA1993, the technique used by nearly all economies today. In this connection, Cuba’s National Statistics Office (Oficina Nacional de Estadísticas, ONE), has recently began publishing national account statistics for the period after 1995 (see ONE 2008, and ONE, 2009). In spite of any problems that the data may have (including the absence of longer time series, high frequency data, as well as some accounting problems derived from the dual monetary and exchange rate system), the data allows the characterization of economic developments post-1995, including growth accounting exercises and international comparisons. The data from the period 1990–1995 was constructed by linking ONE data with data published by the International Labor Organization (ILO), and the United Nations Statistics Division (UNSD). Growth trends are analyzed in the context of a general equilibrium Ramsey model. The model was adapted to allow for two kinds of labor, one that is more specialized and produces exportable services, (e.g., doctors, teachers, etc. ), and one that is less specialized and is employed domestically. The model also allows for (exogenous) increases in human capital that increase the effectiveness of labor, as well as increases in total factor productivity. It also incorporates an index of utilization of the capital stock. Such modifications were introduced in order to better account for country-specific issues, as well as to obtain a measure of total factor productivity that is as “clean” as possible, i.e., not affected by short-term factors (see Annex I). The calculation of long-term growth rates for total factor productivity and human capital yields a rough measure of long-term per capita growth. Moreover, the identification of the parameters of the aggregate production function allows us to gauge the contribution of each factor of production to short-term GDP growth. The model is calibrated using two alternative data sets. The first set corresponds to the official data published by ONE, including labor and national account statistics, as described in the previous section. The second set includes an adjusted time series for national income statistics for the period after the CUC was introduced, based on the official data. The second data set is constructed with the purpose of accounting for the impact of the dual monetary and exchange rate system in the income and expenditure accounts of each economic sector.2 While official national account statistics, as well as price levels, are measured in CUPs at official exchange rates, the alternative series constructed here is calculated in CUCs, using the “unofficial but legal” CUP/CUC exchange rate to convert CUPs into CUCs. The use of the unofficial but legal exchange rates serves to rebalance the shares of tradable and non-tradable sectors in the economy, as well as the those corresponding to the remuneration of labor and capital. 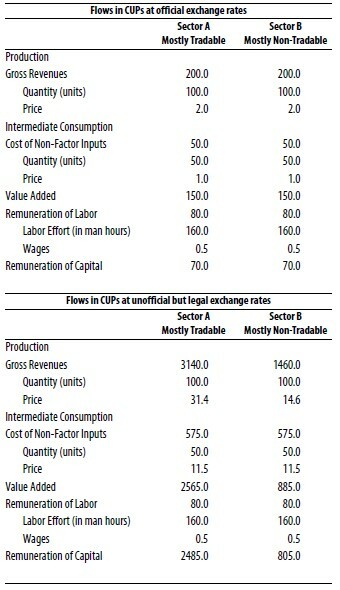 A simple example (Table 1) will serve to illustrate the consequences of using unofficial but legal exchange rates instead of official exchange rates to express flows in a common currency. The first section of the text table shows figures in CUPs at official exchange rates, in a manner analogous to the way official income statistics are constructed. The second section is expressed at CUPs at unofficial but legal exchange rates, after taking into consideration the effect of the dual exchange rates in the prices of goods and factors of production. The third section of the table is expressed in CUCs at unofficial but legal exchange rates. 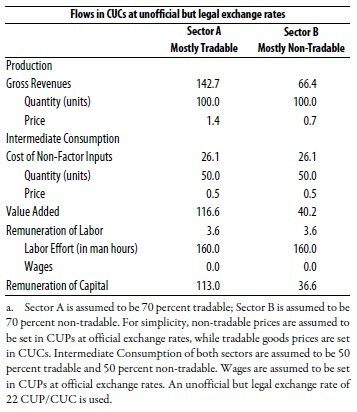 In the example, it is assumed that Sector A is mostly tradable (70 percent of its production is sold at prices denominated in CUCs), while Sector B is mostly nontradable (only 30 percent of its production is sold at prices denominated in CUCs). It is further assumed that transactions quoted in CUPs are conducted at official exchange rates and that both sectors purchase 50 percent of non-factor inputs in the CUC market. Finally, to calculate the shares of the remuneration of factors of production (Capital and Labor) in total income, it is assumed that wages are totally set in CUPs. The proportion of the (mostly) tradable sector in total GDP increases and that of the (mostly) nontradable sector decreases (Column 2 or 3 against Column1). The larger proportion of the tradable sector in GDP that results when unofficial but legal exchange rates are used implies that the economy will be more vulnerable to external shocks. Moreover, given a path for external disturbances, the volatility of GDP growth will be higher than when official exchange rates are used. 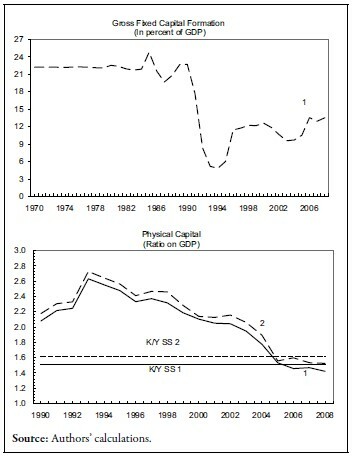 The share of the remuneration of capital in total GDP increases, and that of labor decreases (Column 2 or 3 against Column 1). The proportion of goods produced by each economic sector that is sold in the CUC markets at unofficial but legal exchange rates and that sold in CUP markets at official exchange rates. The ratio between the gross value of production and value added for each economic sector. The proportion of tradable and non-tradable nonfactor inputs used by each economic sector, including what proportion constitutes outright imports; this required the construction of a Leontieftype input-output matrix. The proportion of the remuneration to labor denominated in CUCs. The details of the alternative data set construction are included in Annex II. Sources of short-term per capita output growth, vary somewhat when official or alternative data are used. In this connection, when official data is used, exportable labor explains little more than 1 percentage point out of the 1.6 percent average per capita growth for 1990– 2008. This figure climbs to more than 1.6 percentage points of the 1.7 percent average per capita growth when the alternative data set is used. The larger contribution of exportable labor means lower contributions of total factor productivity (TFP) and domestic labor than those when official data is used. Physical capital contribution is negative using both datasets, suggesting a shrinking capital stock. 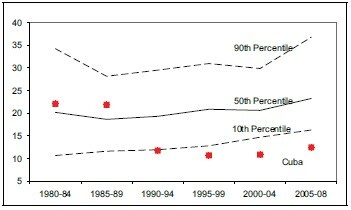 The decrease in the capital stock ratio reflects the strong decrease in investment rates after 1990, and convergence to a new “steady state” capital stock ratio (Figure 1).The decrease in physical capital per capita, together with increases in the labor participation rate suggests that the relative price of capital to labor has increased steadily since 1990. This is likely the consequence of a number of factors, including the end of “cheap” capital transfers from the Soviet Union, domestic institutional rigidities, as well as geopolitical restrictions. For the period 1996–2008, economic performance is markedly different (highlighting the importance of the difficulties during the “Special” period). Out of a per capita average annual growth (using official data) of about 5 percent, increases in per capita physical capital contributed about 0.5 percentage points (mainly through increases in its utilization rate), increases in effective (i.e., human capital corrected) hours worked by the exportable services labor contributed about 1.6 percentage points, increases in effective hours worked in the domestic economy (mainly through increases in labor participation rates and decreases in the rate of unemployment) contributed about 1 percentage point per year, and TFP contributed about 2 percentage points per year. Using the alternative series, out of a per capita annual average increase of about 5.2 percent, the corresponding contributions were about 0.9 percentage points for physical capital, 2.2 percentage points for effective hours worked in the exportable services, about 0.6 percentage points for effective hours worked in the domestic economy, and a TFP recovery of about 1.5 percentage points per year. 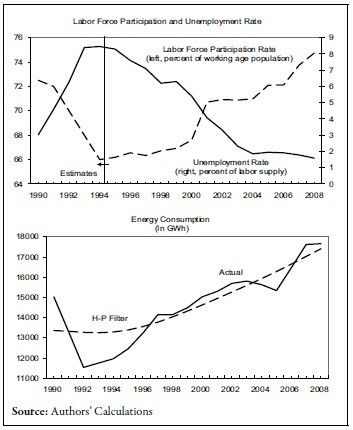 The contribution of different factors of production under either data set suggest that the economy had a relatively large unused capacity by the mid 1990s, and thus, that an important part of the growth observed corresponds to increases of the utilization of physical capital (proxied by energy consumption), increases in the labor force participation rate and decreases in unemployment (Figure 2). The results also suggest that an increase in the share of workers producing exportable services contributed significantly to the resumption of growth (30 percent using official figures and about 45 percent using the alternative series). Growth volatility has been very high during 1996– 2008, exceeding 3.7 percentage points when official figures are used and climbing to 5.7 percentage points when the alternative data set is used (Table 4). The high growth volatility is explained in part by the existence of the low/high sub-periods referred to above. The extra volatility observed when the alternative series is used results from the higher proportion of the tradable sector in total GDP (about 50 percent compared with less than 40 percent when official figures are used). Looking at an even more refined period of the last 5 years, the pickup in average growth and its volatility, in part, reflects an increase in the contribution of net exports to growth, which in itself has been highly volatile. This is in strong contrast with the pre-1990 period in which the balance of goods and non-factor services was consistently in deficit. 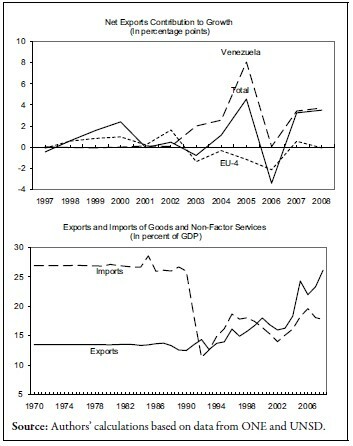 According to official figures, the contribution of net exports of goods and non factor services to growth has increased to more than 1.5 percentage points in the period 2004– 08; in particular net exports to Venezuela, appear to have accounted for about 45 percent of total growth during the period 2004–08. In this regard, the contribution of Venezuela to Cuban growth appears to have increased by a factor of ten in 2004–08 as compared with 1997–2003. Such a significant increase is mostly underpinned by an increase in non-tourism service exports that more than compensated the increase in oil imports. In parallel, the importance of other trading partners has decreased; in particular, the contribution to growth of net exports of goods and non-factor services to the EU-4 (Spain, Italy, France and Germany), which has turned negative, reflecting the fact that imports of goods and services from these countries more than offset tourism receipts during 2004–08(Figure 3). The contribution of goods-producing sectors to the growth recovery during 1996–2008 has been very low, and in some cases close to zero (Table 5). Regardless of whether official or alternative series are used, the contribution of agriculture, fishing, livestock and mining combined amounted to about only 0.1 percentage points to the growth of about 5.3–5.7 percent during 1996–2008. Moreover, manufacturing and construction combined contributed only 0.7 percentage points (using official figures) and 0.6 percentage points (using alternative figures). In contrast, the contribution to growth of public services (including those Cuba exports, like education, health and sports) has contributed close to half of total growth (2.5 percentage points), when official figures are used and about 60 percent of total growth (3.1 percentage points) when alternative figures are used. Tourism-related activities contributed about 20 percent of total growth (between 0.8 and 1.1 percentage points). Employment has become more dependent of the public sector and, services-producing sectors more generally. This is in line with developments in GDP composition. Indeed, while total employment grew at an annual average rate of about 1.4 percent per year during 2002–08 (equivalent to a creation of a total of 390,000 jobs), the share of employment of goods-producing firms in total employment decreased by about 5 percentage points (with a net employment decrease that exceeded 100,000 jobs). In contrast, employment in public, personal and social services increased by about 480,000 jobs during the same period, with its share in total employment climbing to about 42 percent, up 7 percentage points since 2002. Public finances have become increasingly dependent on non-tourism services exports, the vast majority of which appear to come from Venezuela. These revenues started at levels of about 11 percent in 2002–03, jumped to the 15–20 percent range in 2004–07, and then skyrocketed to more than 30 percent in 2008. The evolution of these revenues has a counterpart in exports of non-tourism services, in the increase in the share of service-producing sectors in GDP and the increase in the share of service-producing sectors in total employment. The remuneration of capital as a share of income has averaged 54 percent when using official figures, but this figure climbs to 68 percent when using the alternative dataset. Consequently, while the remuneration of labor comprises about 46 percent of national income when using official statistics, it decreases to about 32 percent when using the alternative series. 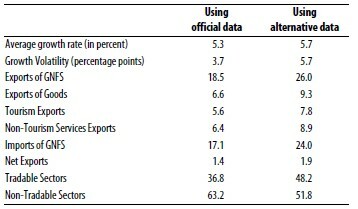 Most importantly, the remuneration of labor employed abroad (i.e., that resulting from the exports of non-tourism services) averaged 7 percent of income using official statistics, but climbs to 10 percent of income when using the alternative data set (see table with calibration results in Annex I). The remuneration of each factor of production as a share of total income is essential for the analysis of growth, both from a short and long-term perspective. This is the case, as the functional form assumed for the production function, a standard Cobb-Douglas, uses such shares as parameters. An analysis of long-term growth accounting points to significant underlying weaknesses. Conclusions on long-term per capita growth are dependent on the data set employed, and can only be identified in ranges, reflecting the fact that the results are sensitive to the initial capital stock chosen. The initial value for the stock of capital is relevant, as a higher value would result in a lower contribution of capital to growth, and thus, in a higher estimated TFP contribution. Conversely, a lower initial capital stock would result in a higher capital contribution to growth and lower estimated TFP (Table 6). Using official figures, the TFP contribution to longterm growth (i.e. at steady state values for per capita capital and constant labor force participation, unemployment and utilization of capital stock rates) would be in a range between 0 and 1 percentage point per year. With human capital growth (proxied by average schooling years of the labor force) contributing about 0.8 percent per year, total long-term annual per capita growth would fall between 0.9 and 2 percent. Using the alternative series, however, TFP contribution could be negative, ranging from -0.9 to 0.5 percentage points per year. When added to a human capital contribution of about 0.8 percentage points, the resulting per capita long term growth would range between something slightly below zero (-0.1) and about 0.5 percent per year. The assumption consistent with the upper bound of the growth range is that the initial capital stock (i.e., in 1990) is an average between the steady state capital stock pre-1990 and the post-1990 steady state. This assumption is consistent with the view that after the collapse of the Soviet Union, only a portion of the Cuban capital stock became unusable. The lower bound of the growth range reflects a stronger assumption with regard to the effect of the collapse of the Soviet Union on the obsolescence of the Cuban capital stock. It assumes that, a portion of the capital stock equivalent to the difference between the old and new steady states became obsolete.4 Figure 4 shows the estimated TFP path for the period 1990–2008 using official figures (labeled as “1”), and alternative figures (labeled as “2”); the estimations shown correspond to the upper bound obtained using both data sets as referred to above. The chart includes an additional line (labeled as “1”) that corresponds to the estimated TFP path that would result from calibrating the model using official output data, net of non-tourism exportable services. The results seems to indicate that most TFP gains in the period post-2005 (using both official and alternative data sets) are associated with the large (and possibly unsustainable) increase in exports of nontourism services. As the rate of increase of such exports diminishes, TFP growth will decrease, and could even turn negative if the large levels of non-tourism exports begin to decrease. A possible factor explaining the weakness in TFP might be related to the very low levels of per capita physical capital in Cuba, and questions as to its quality. Productive capital is a source of TFP and long-term growth, as it results in better and more efficient organization of production, and yields other types of aggregate externalities. Cuba’s investment rate, however, is very low by international standards, having averaged about 12.5 percent of real GDP during the recovery period (1996–2008). Indeed, in a panel for the period 1980–2008 and that includes 157 countries, Cuba’s investment rate has been consistently below the lowest 10th percentile during the period 1990–2008. In addition, the investment rate has not significantly picked up during the recent high-growth period, suggesting the existence of strong constraints to capital accumulation (Figure 5). The long-term picture is clouded even more when observing the composition and possible quality of investment, as machinery and equipment, (a channel for investment-specific productivity, as Greenwood, Hercowitz and Krusell (1997), emphasize) has averaged only 2.6 percent of GDP during the period 2002–2008. The average investment rate picks up somewhat (to about 14.5 percent of GDP during 1996–2008), but remains low, when the alternative dataset is used, as investment in machinery and equipment is mostly imported and a significant part of investment in the tourism sector is made in the CUC-related sector. Clearly, if constraints to capital accumulation were lifted, long term growth would likely increase. Economic developments in Cuba during the last 20 years can only be understood after accounting for the strong short-term impact and structural changes that the fall of the former Soviet Union imposed on the Cuban economy. In this connection, short-term growth dynamics were strongly affected by developments in two distinct phases. In the first phase (1990–1995), when growth collapsed, large portions of the capital stock became obsolete, the intensity of utilization of the capital stock plummeted, the unemployment rate increased significantly, and labor force participation rates decreased strongly. In the second phase (1996–2008), when the economy stabilized, the intensity of utilization of the capital stock increased, the unemployment rate decreased, and the labor force participation rate increased. Human capital growth has been growing, at about 0.8 percent per year. Physical capital has converged to a lower steady state, reflecting significantly lower investment rates in the period after 1990 in comparison to that before 1990. This has resulted in lower levels of physical capital per capita, likely reflecting the higher cost of capital with respect to that of labor. The composition of GDP and that of the labor force have changed toward service-producing sectors, decreasing the significance of the goods producing sectors in the economy. This appears to reflect an increase in the importance of net exports in GDP, though it remains to be seen if this is a sustainable source of growth. TFP has decreased strongly following the collapse of the former Soviet Union and has recovered only recently towards 1990 levels. The strength of the TFP recovery is sensitive to whether national income statistics are calculated using official or unofficial but legal exchange rates, as well as to the initial (i.e., 1990) level of the capital stock. The fact that the TFP recovery occurs simultaneously with the strong increase in net exports of nontourism services to Venezuela may be flagging that part of what is measured as TFP increases post- 2002 might not be permanent. All in all, long term growth rates are low and probably close to zero. This might be the result of constraints (external and domestic) to investment and capital stock accumulation. The collapse of the Cuban economy that ensued with the fall of the Soviet Union illustrates how strong a role external factors can play in domestic economic developments. In this connection, the reasons for the strongly negative GDP growth rates during the first half of the 1990s were likely multiple, but it surely reflects the economy’s lack of diversification regarding its trading partners. The dependence of the Cuban economy on the Soviet block was multi-dimensional. It involved not only “cheap” imports of capital and energy, but also a sort of economic integration that left a substantial part of the capital stock obsolete after the special relationship between Cuba and the former Soviet Union ended. While GDP stabilized and recovered somewhat beginning in 1996, growth rates remained, on average, relatively low considering the strong decreases that had been observed during the first half of the 1990s. It was only after 2004, when exports of non-tourism services began to increase strongly, that pre-1990 GDP levels were reached. Venezuela appears to be the main destination of nontourism service exports and a strong engine of shortterm growth, as net exports from Cuba increased strongly during the last five years. In parallel, the economy appears to have become increasingly dependent on such external sales, with the observed gains in employment, GDP and fiscal revenues strongly linked to the export of such services. Although at a significant lower scale than that observed before the 1990s, the lack of diversification in Cuba’s export markets for non-tourism services increases the vulnerability of Cuba’s economy. In this connection, not only is the GDP growth rate subject to greater volatility, but also the strength of the GDP recovery might be capped, as the high growth rates in non-tourism exports to Venezuela are likely to decrease and their levels stabilize. Moreover, the degree of this vulnerability depends on Venezuela’s ability to keep its purchases from Cuba at their current high levels that, in turn and to a large extent, reflects the (highly volatile) international price of oil and Venezuela continuing its current policy to the island. 1. We thank Juan Belt, Luis Locay and participants at ASCE’s annual conference for helpful comments. The views expressed in this paper are those of the authors and should not be attributed to the International Monetary Fund, its Executive Board, or its management. 2. The model was also calibrated using a third data set comprising official national accounts data, but excluding exports of non-tourism services. 3. In the figures below, lines labeled with a “1” correspond to estimates using official figures, while those labeled with a “2” correspond to estimates using alternative figures. 4. While the model attempts to isolate TFP from short term developments, it is possible that TFP is reflecting non long-term factors. After the collapse of the Soviet Union (a long-term development), TFP decreased strongly, by about 25 percent, and remained low at such low levels until about 2002, when it began to pick up. The increase after 2002, however, appears to be correlated with the strong increase in exports of non-tourism services, a portion of which is accounted in the production function. As net exports stabilize, it is possible that TFP will remain constant or even decrease in the years ahead., which would result in a further reduction in the assessed long-term per capita GDP growth rate.